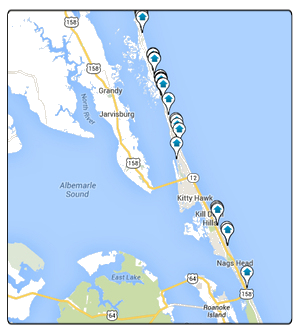 At the northern end of the Outer Banks is the community of Corolla. Corolla is famous for it’s wild horses, the last known herd of Spanish Mustangs on the Outer Banks! Corolla’s sparse commercial development and breathtaking beaches make it the ideal place to call home. Looking for solitude? Corolla actually has homes that are only accessible in a 4 wheel drive along the beach!